Pressure cooker corned beef and cabbage is an easy and delicious way to get dinner ready in minutes instead of hours! 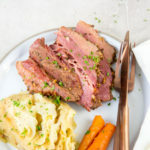 This low carb corned beef brisket can also be easily modified to be cooked in a crockpot or slow cooker so you can come home from work and enjoy a nice home cooked meal! Add the beef to an Instant Pot with the fat side facing up. Sprinkle the spices on top, and then the garlic. Add the onion on the sides of the beef, and then pour in the broth and the Worcestershire sauce on all sides of the meat. Cook on Manual, High Pressure for 60 minutes, and then do a Natural Pressure Release. Transfer the meat to a platter and cover with foil to keep warm. Leave the liquid in the pot and add the cabbage and carrot. Cook on Manual, High Pressure for 3 minutes and then do a Quick Pressure Release. Transfer the vegetables to the platter with the meat. Strain the liquid and serve it along with the vegetables and meat to drizzle on top.